I can’t remember exactly how I got on this Gaul kick, but here I am. I must’ve been looking for some Giro inspiration beyond my ritualistic May reverence for Il Pirata when I stumbled upon a few intriguing images. I’ve known the legend of Charly Gaul for quite some time, but besides him behing the “L’Angelo della Montagna”, I didn’t truly know why. Obviously, I did some research. This is where the word ‘epic’ was born—stories such as Charly’s magnificently insane ascent of the Monte Bondone during a snowstorm. 89 tragically underprepared riders set out, unaware of the arduous task before them. 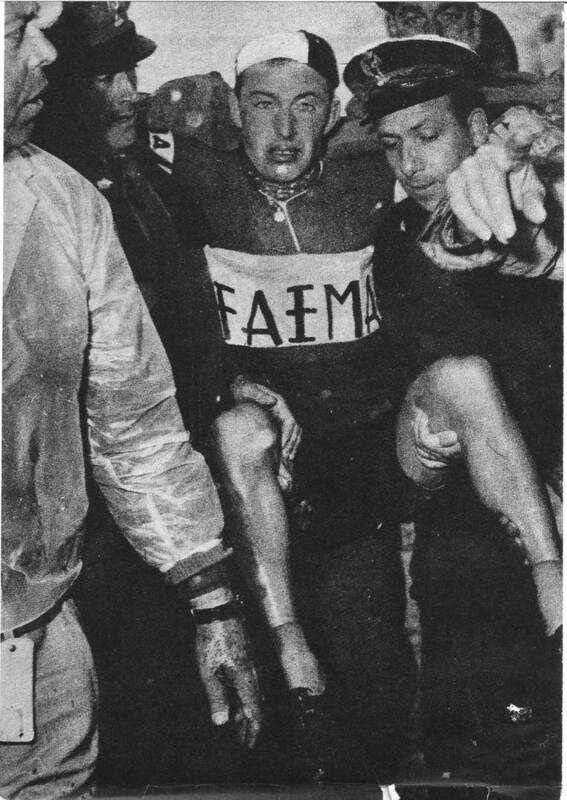 Gaul was relentless on the 3 successive climbs (the Costalunga, the Passo Rolle, and the Broncon) before the Monte Bondone finale, only to be brought back or suffer multiple punctures. 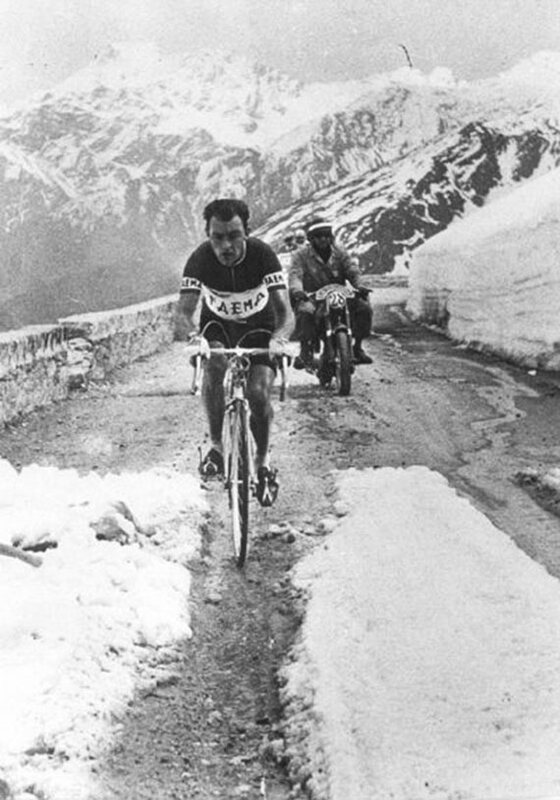 Finally, after catching everyone on the road again, he began the 14km assault of the Bondone. 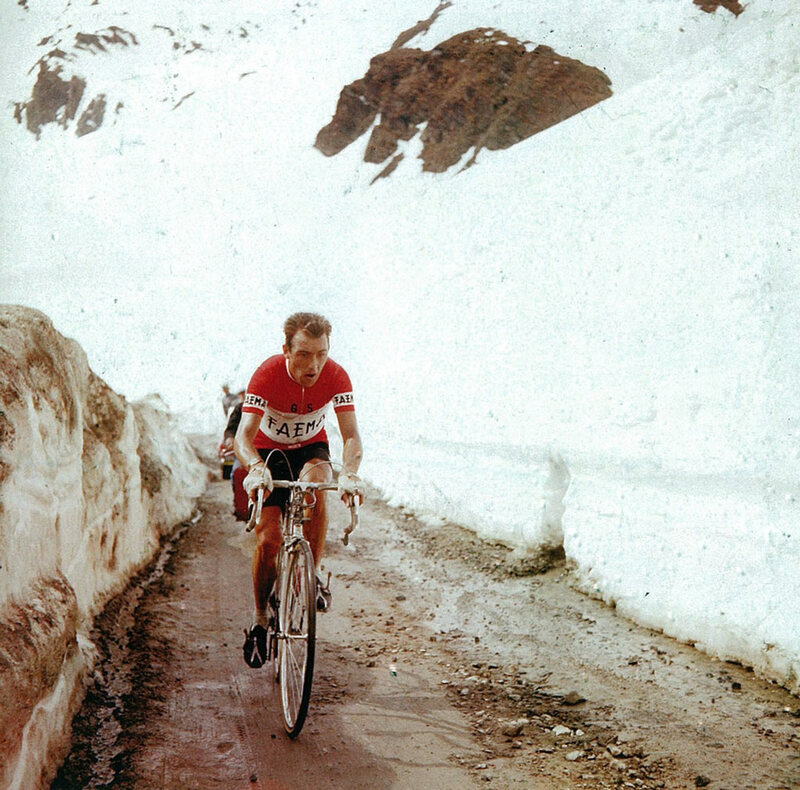 It was here, on the slopes of this 5413′ mountain, where torrential rains that decimated the peloton throughout the day changed to snow. Eventually, high winds categorized the wintery event as a blizzard. Riders abandoned in droves as they froze to the bone tackling the stage’s finale. Those who continued only did so by momentarily seeking refuge from the weather or warming their extremities with hot water provided by the roadside fans. Charly himself, had to stop at a roadside trattoria for a cup of coffee. His team, frantic to find their rider in these incredibly dangerous conditions, finally caught up with him as he sipped in the bar. After warming his body with water and a massage, Gaul remounted his bike to take the stage a full 12 minutes ahead of the next rider. Of the 89 riders starting the 18th stage of the ’56 Giro d’Italia, only 43 finished. Some of those crossing the line that day did so in their teams cars, yet were allowed start the next stage. 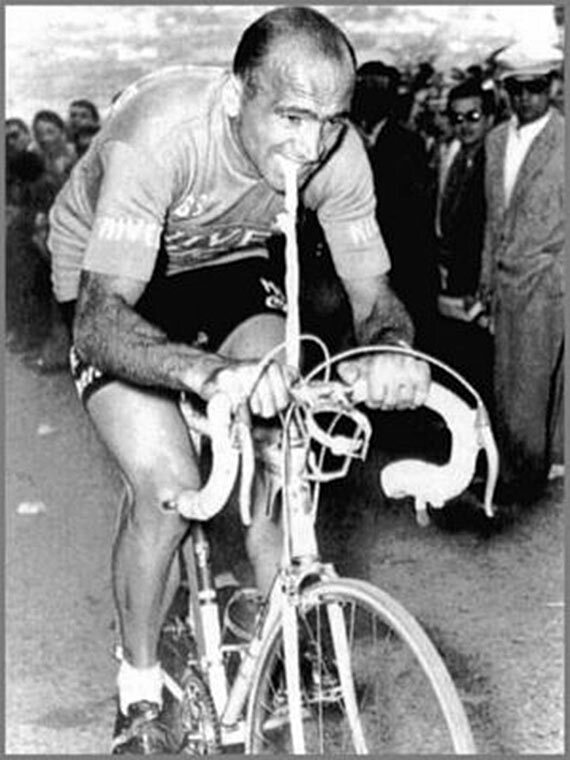 Charly Gaul was crowned Giro champion 2 days later. I’m sure you’ve seen this epically monumental lifetime hardman shot of Fiorenzo Magni before. He was chasing Gaul until the bitter end despite breaking his collarbone and humerus. 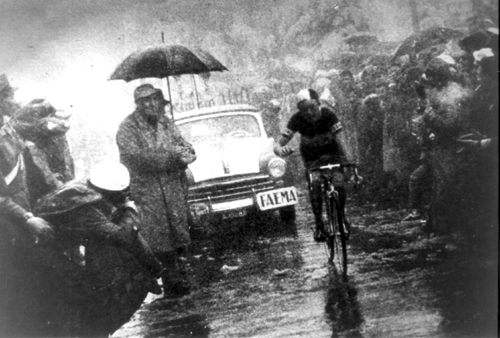 He finished the ’56 Giro on the podium with an astounding second. Charly Gaul is a popular subject.